In a fun twist on the classic pineapple upside down cake, this recipe turns a kitschy tropical flavored dessert into one that captures all the flavors of crisp fall days. 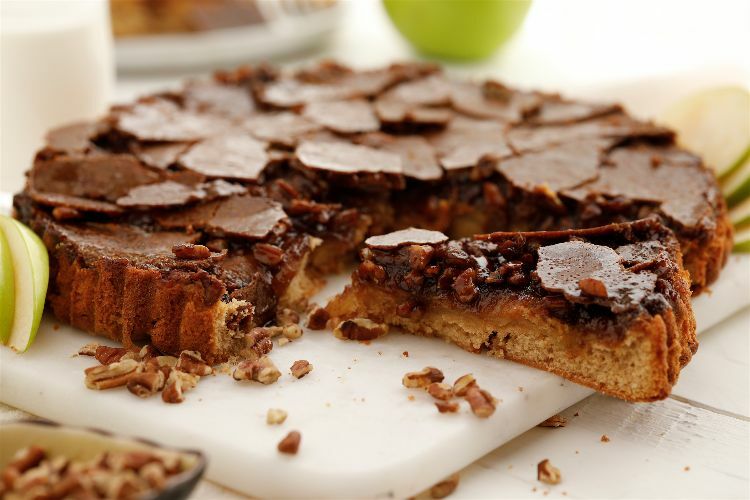 With sweet rings of apple and toasted pecans in a caramel sauce that makes itself right in the pan along with the cake, this is sure to be a hit on your dinner table. I like to use a sturdy and tart-sweet apple such as Granny Smith for this dessert. This cake is stunning right out of the pan on its own, but it's even better served with a dollop of whipped cream or a scoop of vanilla ice cream. If you were looking for something to spice up your holiday dessert buffet, look no further. In a small saucepan over medium-high heat, melt the butter. Stir in the brown sugar and cook, stirring constantly, until the sugar is fully dissolved and the mixture is smooth, about 4 minutes. Pour the melted butter mixture into a 9-inch round cake pan and spread it out in an even layer covering the bottom of the pan. 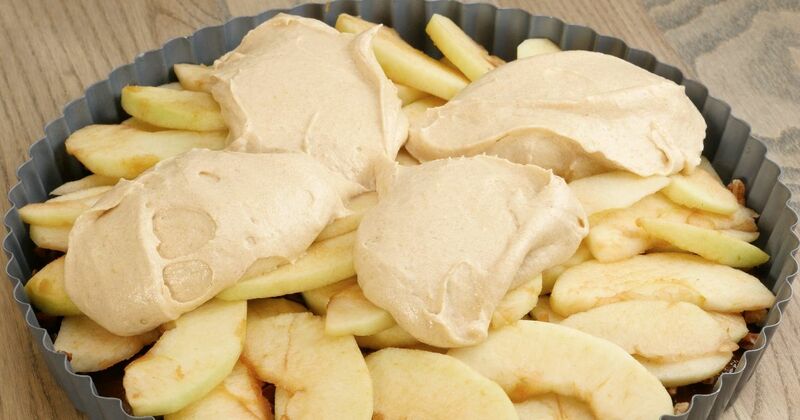 Sprinkle the pecans over the butter-sugar mixture and arrange the apple slices over the top in concentric circles, with the wedges slightly overlapping each other. To make the batter, in a medium bowl, whisk together the flour, baking powder, cinnamon and salt. Add the butter and beat with an electric mixer set on medium until the mixture is fluffy and light. Add the sugar and beat for about 4 minutes longer, and add the egg and vanilla and beat until incorporated. Set the mixer speed to low and beat in the dry ingredient mixture and the milk in alternating batches, beating just until incorporated after each addition. Pour the batter over the topping in the baking pan and smooth it into an even layer. Bake the cake in the preheated oven until a toothpick inserted into the center comes out clean, 50 to 60 minutes. Remove the cake from the oven and let it cool on a rack for 15 minutes. Loosen the cake from the pan by running a knife around the edge of the pan and let cool for another 10 to 15 minutes before carefully inverting the cake onto a cake platter. Serve warm. Pro tip: Use a table knife to shatter the hardened caramel top on the cake. This will make it prettier and easier to slice!